These rugged steel shelf supports fit a standard 1/4" hole. 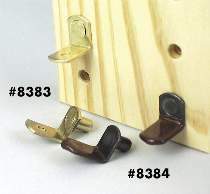 Screw hole in 8383 brass supports allow you to attach support to underside of wood shelf. Screws not included. Antique bronze supports have vinyl “cushion” to keep wood or glass shelves from rattling. Come in pkg of 20.